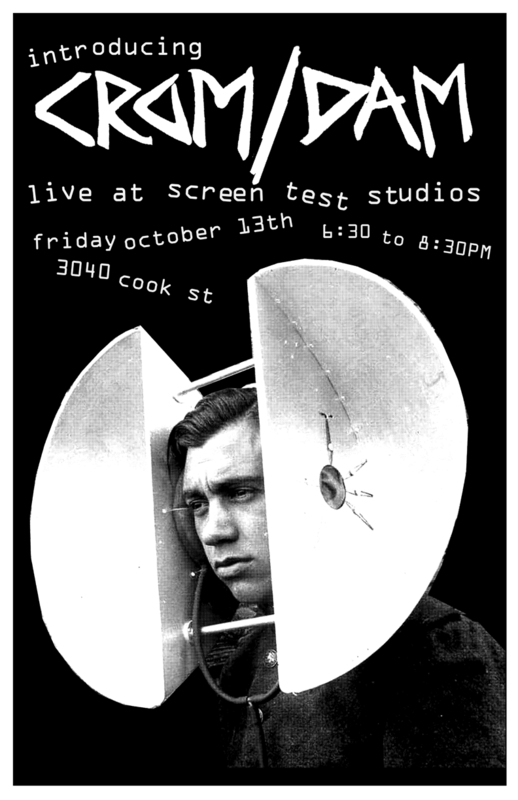 Crom/Dam are playing their debut gig over at Screen Test Studios on Friday the 13th...Victoria's newest band...a two-piece static punk combo. Recommended if you like...thump thump, bzzzzzzzt-bzzzzzzt, yowwww yowwwww, chkkkk chkkkkk! Doors open at 6:30...come hang for a bit while MUTANT DISCO DJ's spin punk-rock, garage, nuuu wave, power-pop, rock'n'roll, art spazz, ridiculous crap and other records...BAND PLAYS at about 7:30...then everyone can head out at about 8:30 to catch one of the other shows going on that night. 3040 Cook St...back, downstairs door. Bring $5 for band and money for merch and some of the hundreds of records and cool T-shirts we sell outa our basement. Bring booze in a bag to drink and share with all your new friends! All ages...if you're stuck babysitting...bring those brats!